A couple days after Jan. 1, husband Walter and I spent some of his time off (as in a couple of hours) vacationing locally. We both enjoyed a visit to Lovelace Drugs on the main street of Ocean Springs. Lovelace has been there forever; and a number of years ago, the owners refurbished the old-fashioned soda fountain and added bright seating and tables reminiscent of the heyday of soda fountains. Husband Walter enjoys a milkshake in the midst Lovelace’s red and white soda fountain décor. I suspect the flavors offered have expanded. I told hubby to surprise me. He selected a Snickers milkshake for us to share. Snickers candy bars are among my (many) forbidden pleasures. 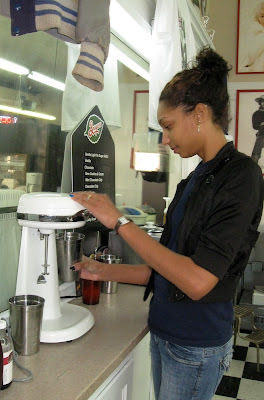 Soda jerk Oreyel of Gulfport creates our Snickers milkshake. 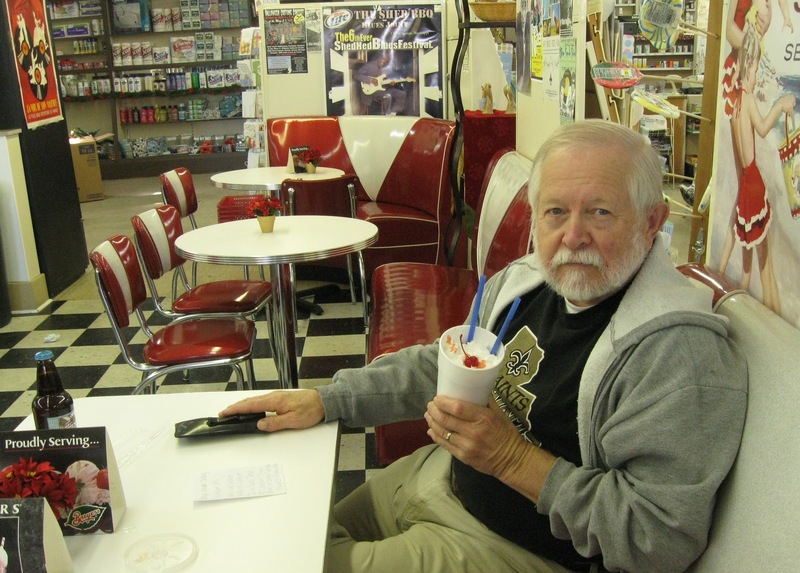 I first admired the Lovelace soda fountain almost three decades ago when I started working at the Mississippi Press bureau as a receptionist and jill of all trades then later as reporter, feature writer and photographer. The word “bureau” paints a misleading picture of the shabby WWII-era cottage that provided office space for the official Ocean Springs reporter, an advertising salesman and me. I counted the location behind Lovelace’s parking area as an advantage, though. It only took a moment to pop over to Lovelace, zip through their back door and pick up anything from office supplies to a prepackaged snack. It took awhile for the light to dawn about a mirrored area near the backdoor. 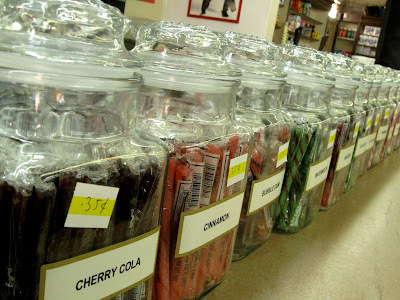 Hidden behind and underneath stacks of boxes of products destined for the drugstore’s shelves were marble-topped work areas and counter of a soda fountain. Today the dark wood I admired is a cheerful bright white, and the counter top includes jars of candy that require quite a few more pennies than in years past. But they are still tempting. With our visit to Lovelace’s soda fountain, I can now check off one more item that has been on my “want-to-do” list for quite awhile. But the satisfaction of this little excursion far exceeded the time and money invested. The Lovelace soda fountain definitely created the magic of a bygone era for us! I used to go to soda fountains. A sorrowful departure in this world, what makes us long for them so (at least us seniors, most of the young'uns probably never heard of them) How close is this to you? You are lucky to be near one.